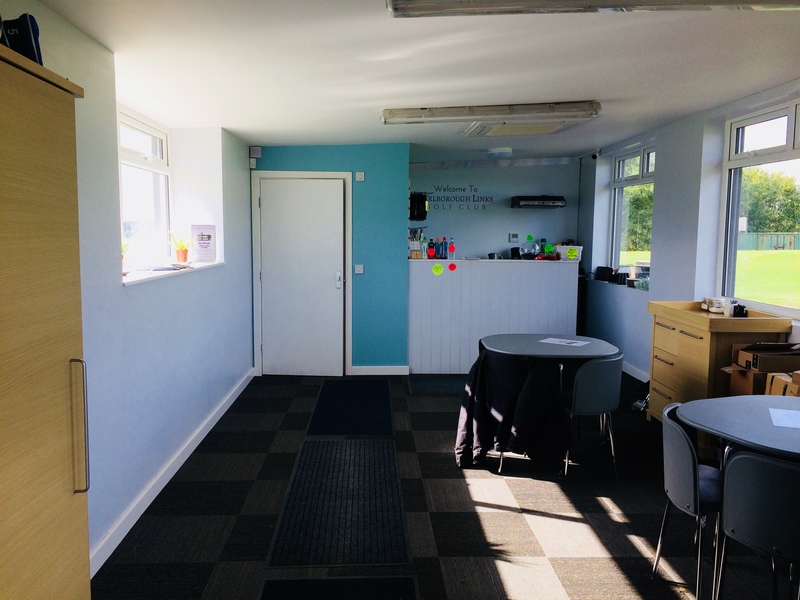 Our driving range Reception and Coffee Shop was borne from the intense disliking of being in the blue portacabin, less affectionately known as ‘The Rabbit Hutch’. We took over in June 2016, and it was apparent within a few weeks that staying in there and operating Reception from in there wasn’t really a short, medium or long term option for us!! ‘Ive got it! We’ll remove three range bays and use them to build a temporary facility we can operate Reception from and provide a coffee shop to give more of a ‘club’ feel to the place. Fran – get me the phone’. So thats what we did! Andrew still feels suitably smug at his genius idea, so do give him a pat on the back when you see him because everyone who visits agrees that its a step in the right direction. We currently serve a small selection of tea, coffee and soft drinks. We intend to finish off some more internal works before selling hot bacon and sausage sandwiches. Next step after that is a liquor licence! !